The tall, beautiful red-haired exchange student, Julia Olsson from Sweden, is practicing the dance movements enthusiastically, sometimes laughing out loud and sometimes she and her Yosakoi teammates’ eyes meet happily at the campus of Kochi University. But everyone takes the dancing seriously. The festival is coming soon. The Yosakoi Festival in Kochi is one of Japan’s 10 largest festivals. Teams from all over Japan come and perform complicated team dances on the streets around Kochi. It is held over four days from August 9th to 12th every year. It starts with about 4000 fireworks, putting the entire city in a festive mood. Yosakoi has become irreplaceable for Kochi economically and culturally and offers both visitors and participants a unique experience. Julia decided to join the team Suiren (粋恋), which is the most popular Yosakoi team in Kochi university. Every year, Suiren gets quickly filled by students to the point where some students end up on a waiting list. She first heard about Suiren from her friend who had joined the Yosakoi Festival last year. It seemed like a lot of fun, so she joined the team together with her friend. She is going to go back to Sweden on August 26th, so this is the last chance for her to join Yosakoi Festival. “I wanted to do an exchange year in Japan to study Japanese, as it is my major.” Julia explained. “One of the choices of universities I had was Kochi University.” She chose Kochi because she has heard a lot of good things about there from her friend and Kochi had a lot of opportunity to speak Japanese than big city. The dancers are the most important for Suiren because it cannot exist as team without them. “I think it has continued because every year many students choose to join this team and enjoy dancing from the bottom of their heart.” Yuki Sakaguchi, the 15th head of Suiren described with a big smile. “The feature of our team is a strong sense of unity and being able to have fun regardless one’s dancing skill. This is the team’s first time that an exchange student joined Suiren”. Julia will become a legend in this team. The Yosakoi Festival started in Tosa (the old name of Kochi) in 1954, the postwar-period of Japan as a form of restoration of Japan, and also as a way to revitalize the local shopping arcade Obiyamachi. There are three basic rules the dance teams must follow. First, each team has to make their own song based on a traditional local folks song, and the lyrics must include the phrase Yosakoi Naruko Odori (よさこい鳴子踊り). Next, the choreography of most Yosakoi dances have to include moving forward while clapping wooden clappers called Naruko, without moving too much backwards or stopping too often. And finally, each team has a Jikata-sha (a large moving decorated truck), which plays the music that the team made themselves and the team is guided by Jikata-sya. The rules are quite open and costumes vary greatly from traditional to modern from team to team. New ideas have been added to the songs and dances. “Yosakoi will change with the times” said Eisaku Takemasa who is the founding father of Yosakoi. Yosakoi is usually performed by large teams of up to 150 dancers of all ages. From 1987 onwards, each team became limited to 150 or fewer people. Before 1987, one of the largest teams had 800 members. Last year (2016) the number of participating teams were 205, dancers were 18,000. The same number of people are expected participate this year as well. 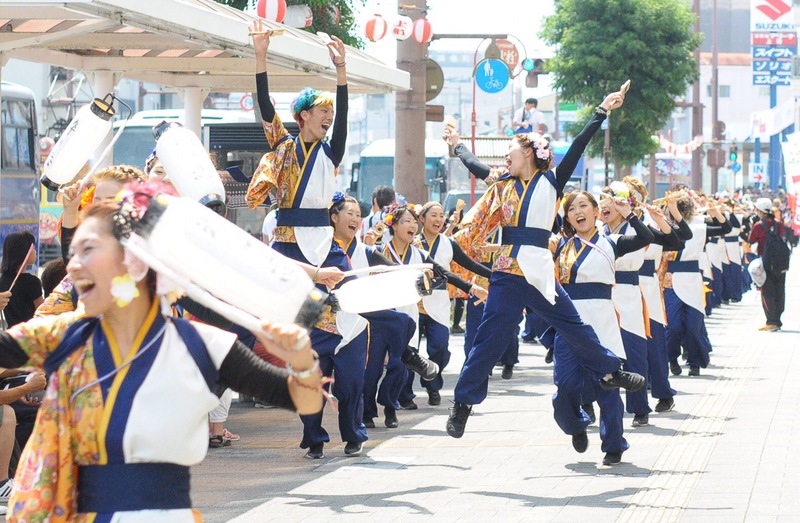 On a hot summer day, people dance energetically with the Naruko while chanting and smiling. It is quite impressive. Depending on the team, the clothing can be vastly different. Usually, the dancers wear multicolored costumes which are based on Kimono (traditional Japanese dress), and often wear a colorful headwear, such as a headband. The free and highly energetic dances catch many people’s hearts and it has spread to many parts of Japan and even outside of Japan. Yosakoi Festival is the most important tourism resource in Kochi and has a big impact on Kochi economy. Yosakoi Promotion Association, which was established with the aim of promoting commerce, industry and development for local communities by Yosakoi, described that the effectiveness of it. According to an Economic Ripple Effect Survey, the total economic effectiveness of Yosakoi in 2013 brought in 8,591 million yen. The effect of spending by tourists outside the prefecture was also high. Each region’s Yosakoi organization is working together by starting different activities in order to show Yosakoi at the Tokyo Olympic and Paralympic Games in 2020. For Julia, the Yosakoi experience has been an important part of her year abroad. She has made a lot of friends through Yosakoi. The best part of Yosakoi is that everyone can be a part of the team even though one cannot speak Japanese perfectly. It is the good article I think. YOSAKOI must change her life and good opportunity to experience the local culture in Japan. Even it is going to be a hot day, I’m looking for the festival this year, too. Yosakoi made some connections every year, it is a fantastic culture in Kochi. I’m looking forward to see Yosakoi festival! This summer, I’m going to join Yosakoi festival for the first time. I can’t wait it!! YOSAKOI is a way to build the relationship even they are not Japanese. It’s a thing all people from Kochi or other prefectures realize that summer is coming here when they see the festival every year. Yosakoi can makes us happy and connects people. It’s a good festival! I have never visited to Yosakoi, but I can imagine the fun from your article. Wonderful article! I loved learning about the festival and how it is important to Kochi University. Sending love from Arkansas! I can really know how YOSAKOI is wonderful from this article! I’m sad l can’t go see it this year but l’m sure it will be a great festival ! Great article!! I enjoyed watching Yosakoi, especially Suiren! I guess it was wonderful because they practiced very hard every day. I hope I will go to Yosakoi festival next year. It’s amazing that you joined such a wonderful festival. Your dancings make us happy! Yosakoi festival seems good festival because I read that people, even foreigner, can enjoy with a lot of people.